The debut Hindmarsh Collection release for Pirate Life began nearly three years ago. Clearly these things take time, however the relationship cemented between the brewery and Limeburners distillery, regarded as one of the world’s best, quickly evolved through mutual admiration and respect, and more than a few beers. The series premiere is a blend of 30, 18 and six-month-old American oak whisky barrel aged stout and arrives in an elegantly noir package that evokes a similar statement of intent to that which launched the brewery less than four years ago. Although, in this instance, 2014’s brash attitude now meets maturity, refinement and subtlety, a little like the original 1838 urban planning design of Hindmarsh that lattices the label. Dark malt and oak aromas move from the glass with an earthy base note and hints of alcohol. While the moody appearance in the glass might be foreboding, the reality is far more delicate and well integrated with a length that was designed to work in harmony with the nuance of the whisky – this is a Hindmarsh stout not a dense Tsarist expression. It’s a fine move that provides cohesion yet allows the stave vanilla to weave in and out of the palate in tandem with oak tannins, chocolate, subtle coffee and muted savoury notes. Fuggles and EKG hops imbue subtle supportive bitterness, while the barrel tannins provide a more forward contrasting element as sweetness fades through the finish. Those with enough restraint will find this evolves further as it warms. 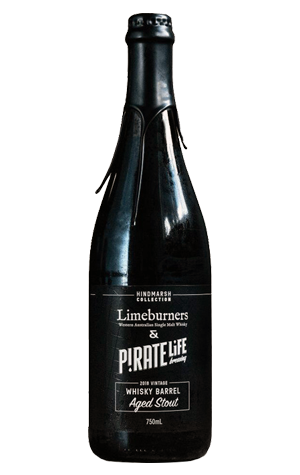 In a corollary to this collaboration, the Pirate Life team has distilled a whisky with Limeburners and barrels continue to arrive at the brewery, wetter than ever. While peated, rum and gin barrel projects are proposed, along with 40-odd other beers pencilled in for 2019, right now the initial Hindmarsh Collection release asks only for a little dram on the side and a little quiet time.